Procure two fine English pheasants with handsome plumage, remove the skin with the feathers from the neck and upper breast, also the wings and tails, being careful not to destroy their beauty. Fix the heads in such a way that they retain their natural appearance. Bone the pheasants, spread tin-in open on a cloth. Prepare half a pound of peeled truffles cut in quarter-inch squares, half a pound of fat livers the same size; make a forcemeat with three-quarters of a pound of white game breasts and one pound and a quarter of pork tenderloin, also adding two pounds of fat pork. Chop the whole separately and very finely, season with galantine spices (No 168) and pound to a pulp; press it through a sieve, afterward adding some finely chopped truffle peelings; mix this well with the squares of truffles and fat livers, also a few pistachios. Season the pheasants, divide the forcemeat in two parts, one for each bird, and fill them with it; roll the two galantines in separate napkins, tie firmly at both ends and in the center: cook in a game stock made with parings of white meat game; when well done take them out and leave to cool off slightly; re wrap in the same napkins after cleansing them in clear water, having them six inches long; tie them uptight at the ends and leave to cool under a light weight; unwrap when cold and glaze over with a not too thick In-own chaudfroid (No. 594). Ornament one end with the head, and the other with the tail, placing the wings on the sides, keeping them in position with skewers; the necks should be strongly salted and have a rather thick wire inserted in the bone of the head, then stuffed with cotton so that it resumes its original size and shape: finish with an oval piece of cardboard about three inches in length. Dress the pheasants on small oval socles from four to five inches high, these to be made of tin covered with noodle paste (No. 142), glazed and decorated, then placed on a larger socle, regarding the details for which see drawing. These tin socles can be replaced by others made either of stearin or carved rice, or else an oval pie crust the same size as the tin ones. On the edge of the socle lay small cases, each one to contain a truffle glazed over with game glaze (No. 398), or garnished with foies-gras, or else small boned birds stuffed, braised and glazed with brown chaudfroid ( No. 594). 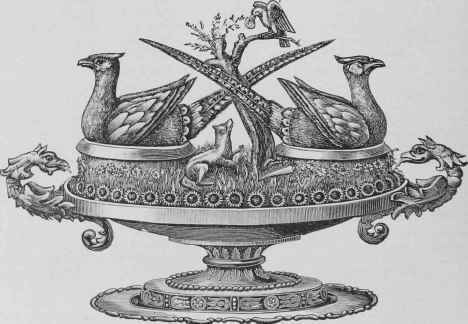 Prepare one pheasant instead of two as dcscribed in the Casimir Perier; dress it exactly the same and stand it on an oval socle four to five inches high by seven and a half inches long and four inches wide; place this on another oval socle about six inches high, eleven and a half inches long and eight inches wide. Pick off all the meat from a young rabbit, cut it in small dice and fry them in fat pork over a brisk fire; when cold, pound and add the same quantity of grated fresh fat pork; pound all together again and season with salt, pepper, and nutmeg; press it through a sieve and mix in with the preparation a quarter as much fat pork cut in three-sixteenths of an inch squares, and then blanched, and as much truffle cut the same size With this fill twelve timbale molds ( No. 2, fig. 137), cover with very thin slices cf fat pork, and bake in a moderate oven for half an hour; remove and set aside to cool. Decorate some timbale molds (No. 1, Fig. 137), with cuts of truffles and egg-white, pour a little jelly into the bottom of each mold. Unmold the No. 2 tim-bales, remove all the fat from the bottoms and sides, pare nicely and then put them into the No. 1 molds, Idling up with jelly; when very firm, unmold and arrange them around the small socle of the galantine exactly under the pheasant, placing a border of jelly croutons outside.